IPEM – International Private Equity Market, is the first international event of the Private Equity offering innovative format centered around business meeting and business opportunities. Designed as a market place, IPEM took place from 17 to 19 February 2016 at the Palais des Festivals in Cannes, brings together professionals from the Private Equity (GPs, LPs, actors debt advice …) and entrepreneurs for three days of meetings and networking sessions. 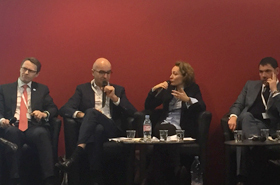 It is in this context that Patrice Chatard, Chief Executive Officer – Co-founder of Finance Active, was invited to answer the question: “How Private Equity can accelerate your business & how to find the right partner?”. For this 2016 edition, 3,000 participants were expected including 1,000 invited VIPs (LPs and entrepreneurs) from 25 different countries.